Let your imagination run wild in 360° virtual reality videos and games that react to your movements in real-time. 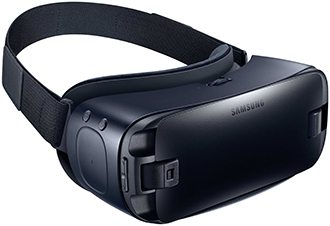 The Gear VR works seamlessly with Galaxy smartphones. Simply snap in your phone and you’re free to take on the world and beyond. Powered by Oculus, the Gear VR immerses you in stunning 360° virtual reality videos and games. Social VR lets you connect with friends so you can chat, watch videos and livestream games on social media as you play. The controller provides new ways to interact in virtual reality by pressing the trigger, tilting, shaking or swinging it in one hand. The Gear VR reacts to the movements of your head, so you feel like you’re inside the game. Ensures comfortable gaming with enhanced suede foam cushioning, an adjustable strap, and easy-to-grip controller.